Right now the debate amongst Cubs fans seems to be whether the team should extend Jeff Samardzija or trade him. Those who have been following the story know it’s much more complicated than just picking one side or the other. From what I’ve learned, it appears the Cubs preference is to extend Samardzija. Of course, as with everything this front office does, they want to make sure that extension comes at what they deem as proper value. 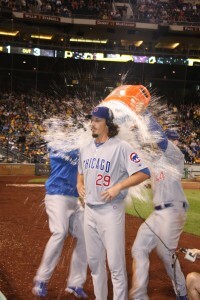 We all know that Samardzija is quite confident in his abilities. While this is a great attribute to have, and Samardzija certainly has many great attributes, this confidence has likely kept these extension talks from getting very far. Samardzija believes he’s worth a lot of money. He’s right – look at what Jason Vargas just got (four years and $32 million), and consider that Samardzija would likely double the AAV of that contract on the open market. But the Cubs have some leverage here, since Samardzija isn’t hitting the open market for at least another two years. Thus, they hold the cards and Samardzija has to decide whether he’d prefer the security of a long-term contract, or if he’d rather spend the next two years in Toronto (or wherever). And that’s where we sit now. The Cubs want to extend Samardzija, but talks haven’t moved far enough yet. Maybe when Samardzija realizes they actually are willing to part with him, he’ll be more open to listen to their hopefully reasonable offer (I’d say something in the five year, $60 million range is very fair). We can debate just how valuable Samardzija is, but I think he’s firmly entrenched himself as a number three* with upside for more, so a reasonably-priced extension would really be the ideal resolution to this situation for the Cubs. *I won’t get into this too in depth right now, because it’s not the point I’m trying to make, but his peripherals the last two years lead me to this conclusion. His higher than normal BABIP last year led to the numbers that have some believing he regressed, but the issues for Samardzija remain the same as they were in 2012: if (and of course that’s always a big if) he can slightly reduce his HR/9 and BB%, he has huge upside. However, as I mentioned on Twitter, I have a gut feeling the two sides won’t come to terms on a deal, and Samardzija will be traded in the next two weeks. If that happens, it leads to a very interesting point for the Cubs. 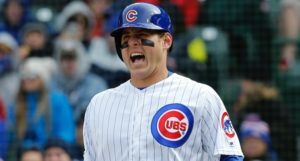 Since Theo Epstein and company came aboard in November of 2011, many of us have pointed to 2014 as the year the Cubs take a small step forward, and 2015 as the year we can look to as a realistic point for when this team can contend for a playoff spot. We can debate whether that’s still a realistic goal, and if they’re actually on course to contend in 2015, but that’s not what I’m trying to do here. My question is twofold. If Samardzija is dealt, does that change the message that’s being sent by the organization? 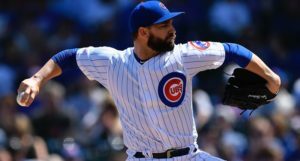 And how does a potential deal alter, if it does at all, the timeline many of us have set for the Cubs? Samardzija has been viewed as part of the core going forward since his breakout 2012 season. 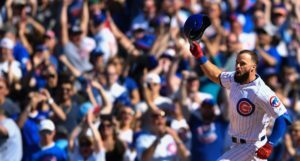 He’s someone who was supposed to blossom into a star alongside Anthony Rizzo and Starlin Castro and help ease future stars like Kris Bryant, Javier Baez and C.J. Edwards into the fold. That was the plan, right? Well, maybe not. We have to remember that this is all fluid. The front office is well aware that nothing is guaranteed. Castro isn’t a lock to bounce back and become the hitting machine we all expected. Baez may eventually be derailed by his aggressive approach both at the plate and on defense and never reach his superstar potential. And Samardzija may not be willing to sign an extension that the Cubs deem makes sense. And that last point is the key here. The plan has always been to acquire young talent and keep said talent under control for as long as possible. Samardzija is part of the core only if he’s willing to take the financial security that the Cubs are offering. Otherwise, he becomes another valuable asset that the Cubs can flip for high-end talent that they can control for the next half dozen years. At first blush, a trade of Samardzija may look like a step back in the Cubs rebuild. Dealing an established starter who has logged less than 600 innings and possibly has more to offer seems like an odd decision. But we’ve gone over why the organization believes they may be forced to do so. And the fact is, the timing may be perfect for the Cubs to put Samardzija on the market. Right now, teams are spending insane money on the free agent market. Having the chance to acquire a pitcher like Samardzija, who is under control for two years at a cheap rate (in this market, whatever Samardzija will make in arbitration is insanely cheap), and who immediately upgrades a Major League rotation is something any team with ambitions to contend in 2014 would like to do. Add in that two of the teams reportedly interested in acquiring Samardzija (Arizona and Toronto) are coming off disappointing seasons and seem rather desperate to upgrade their rosters, and things may be lining up nicely for the Cubs. We ultimately won’t be able to properly judge a Samardzija trade until we know the return, but the Cubs appear to be in a pretty enviable situation as far as having a highly desirable asset in a seller’s market. Just like the front office won’t settle for signing Samardzija to an extension they don’t view as a smart value, they won’t settle for a trade that’s not maximizing Samardzija’s worth. In the end, the message hasn’t changed. But ultimately, it’s not the message that matters to many fans, but whether the Cubs are really on a timeline to start contending in 2015. Does moving Samardzija for prospects change that goal? Of course we don’t know what that return will be, but looking at solely this potential move, it’s tough to argue that it wouldn’t downgrade the Major League roster in the immediate future. Even if the Cubs can manage to snag an elite pitching prospect like Archie Bradley, assuming he’ll offer equal or greater performance than Samardzija by 2015 is optimistic. Again, we’re down to what other moves the Cubs can make in addition to moving Samardzija. Can they surprise many and win the bidding, if it ever happens, for Masahiro Tanaka? Will they be spending big next offseason? At some point over the next year, will they put together a package of prospects to get an under control, front of the rotation-type arm to anchor the staff? And what if a trade of Samardzija nets multiple players who can impact the club in the next two years*? *For example, does acquiring Bradley, Adam Eaton and Randall Delgado add as much value or more than Samardzija would have in 2015? At first glance, that seems like a pretty crazy return to me, but as I mentioned, this market has me reconsidering exactly what front offices consider fair value. If Samardzija is moved, there will be much written about how the Cubs are once again pushing back their timeline for future contention. It’s hard to envision a realistic scenario in which a Samardzija trade makes the Cubs a better team over the next two years. However, we can’t judge the Cubs future solely on if Samardzija is dealt or extended. Getting the answers to the above questions is the key to determining whether the Cubs timeline of contending in 2015 would still be on track. Sahadev Sharma is, among other things, a contributor at Bleacher Nation. Follow him on Twitter @sahadevsharma.